Surely... it's too early for the HTC 11? We were expecting to have to wait until MWC 2017 in late February for HTC’s next flagship phone, but it might be announced as soon as January 12. 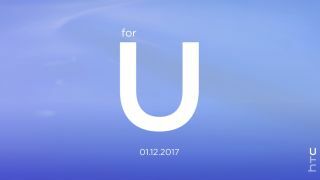 All we know for sure right now is that a “big announcement” is coming from HTC on that date, and that, as per the teaser image above, it’s “for U”. What could it mean? Well, it could be the HTC 11, albeit possibly with a new name – perhaps the HTC U? If HTC’s next flagship phone does have a new name that suggests we could be in for some big changes. But that’s not the only possibility. The curvy U could be hinting at a curved screen device, or maybe it’s not a phone at all – perhaps HTC is about to announce a new tablet or a smartwatch, or something else entirely. HTC used to be partnered with Under Armour, so the U could also refer to a new UA-branded wearable. Or it could be VR-related, given HTC has made a big VR push with the Vive but has so far stayed out of mobile VR. With January 12 just a few weeks away we’ll know soon, and we’ll be sure to update you with any new information ahead of that. But until then, what do U think it could be? Let us know in the comments below.